We at American Luxury Limousine, located just off Highway 101 in Westlake Village, are proud of having been consistently rated as the top rated provider of Westlake Village limo service. Having been located in the Westlake Village portion of Thousand Oaks for more than fifteen years, American Luxury Limousine is the number one choice for anyone seeking a limo in Westlake Village. As Westlake reaches into LA County, its also our main hub for Los Angeles party bus services. We also offer LAX sedan rentals, Malibu wine tour options, and more. Being conveniently situated halfway between Los Angeles and Santa Barbara, and only twelve miles from the Pacific, we service all of Ventura, Santa Barbara and LA Counties. The community of Westlake Village, which is also rated as one of the wealthiest and safest communities in America, is located at the northern foothills of the Santa Monica Mountains, straddling the Ventura-LA county-line. The city borders the Simi Hills to the north and the Santa Monica Mountains to the south, and is partially located within the City of Thousand Oaks. Westlake Village and our Westlake Village limo service company is in the Conejo Valley and is named after a local lake, which lies within the watershed of Malibu Creek. Much of the surrounding area is made up of public open space preserves including trails for hiking, mountain biking, horseback-riding and other outdoor recreational activities. A truly unique thing about Westlake Village is the fact that the area straddles the border between LA and Ventura Counties — divided between a part Thousand Oaks and the City of Westlake Village. The City of Westlake Village was first established in the 1960’s. Back then the City of Westlake was located in both Ventura- and Los Angeles Counties. 2/3 of the city, or approximately 8,500 acres were located in Ventura County, while 1/3 of the city (3,500 acres) was located in Los Angeles County. Later the City of Thousand Oaks grew and neighboring cities were essentially grown together with Thousand Oaks. The town west of Thousand Oaks, Newbury Park, was nearly completely annexed by Thousand Oaks through the late 60’s and 70’s. At the same name, two-thirds of another neighboring city, Westlake Village, was also incorporated into Thousand Oaks. Now the City of Westlake Village is its own city of 10,000 inhabitants, situated in Los Angeles County. The eastern parts of Thousand Oaks is also named Westlake and has it as their address, but the city itself is located in LA County. Our offices on Willow Lane is therefore an ideal location for providing Los Angeles party bus services and limos. And being just 8 miles from wineries in the Malibu Canyon, we have become a top rated provider of Malibu wine tour adventures. 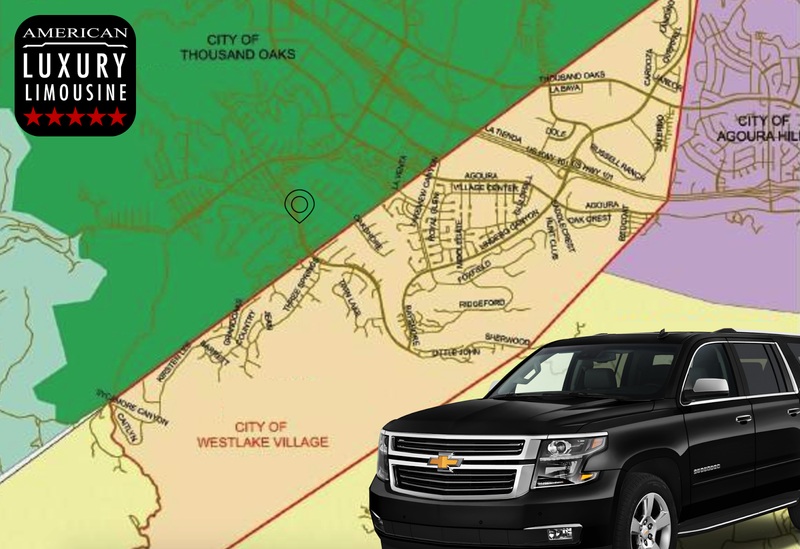 A map showing the border of Thousand Oaks and City of Westlake Village. Westlake Village is not only home to Southern California’s largest selection of limousines and luxury vehicles at American Luxury Limousine, but the city is also home to other commercial headquarters, including for example J.D. Power and Associates, Dole Food Company, Conversant, K-Swiss, and numerous others. When the city was planned in the mid 1960’s, the motto used was “A new city in the country”, which referred to the planners goal of Westlake Village not becoming a bedroom suburbia, but rather a small-town where people would work, shop and live. The American-Hawaiian Land Company bought the 12,000 acre Albertson Ranch and also engaged with the Bechtel Corporation when they made the final master plan in 1966. The plan was revised in 1967 and the City of Westlake Village was established. 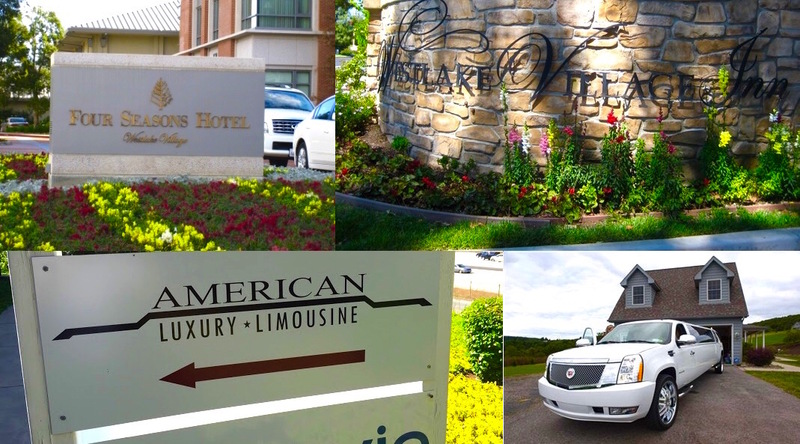 Southern California has changed a lot since then, and Westlake Village has now become home to the largest provider of Los Angeles limo service, American Luxury Limousine. We provide wedding transportation, Los Angeles party bus services, wine tours, LAX sedan vehicles, birthday party limos and so much more. We offer Westlake Village limo services for any event and at any time. Known for its wealth, rolling hills of natural beauty, mild Mediterranean climate and its clear fresh air, Westlake Village is also home to many Hollywood entertainers, artists, and other celebrities. Hopefully without revealing too much about our Westlake Village limo clientele, some of the notable residents of Westlake includes Will Smith, Hulk Hogan, Britney Spears, Kim Richards and many more. Mediterraneo is a top rated restaurant. Many searching for a limo in Westlake Village end up going to the Four Seasons Hotel, Westlake Village Inn, Hyatt Westlake Plaza or another of the top rated hotels in the area. Some of the popular dining destinations for our Westlake Village limo service includes Lure Fish House, Aroha, Tuscany II Ristorante, Carlos Murphy Tequila and Kaminari Sushi. 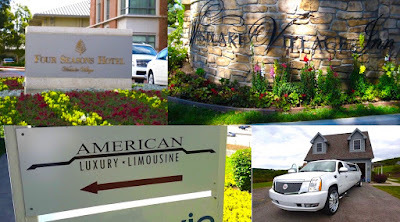 Other popular Westlake destinations for our Los Angeles limo service clientele includes the Spa at Four Seasons, Sherwood Country Club, Cinepolis Movie Theater, the Bogies at the Westlake Village Inn, Wades Wines, Pinkberry and Om Organic Massage. The Westlake Golf Course is also a popular destination, and is one of many golf courses located in the city. For more information about our limo services, feel free to come visit us at 2550 Willow Lane or call us toll-free at any time to talk to one of our reservation specialists. Come for a dance party at Bogie's! Malibu wine tours are some of the most popular bookings from Westlake. We also get a huge amount of calls for limousine and LAX sedan rides to/from this city. But we also get calls to the some very popular attractions in town. 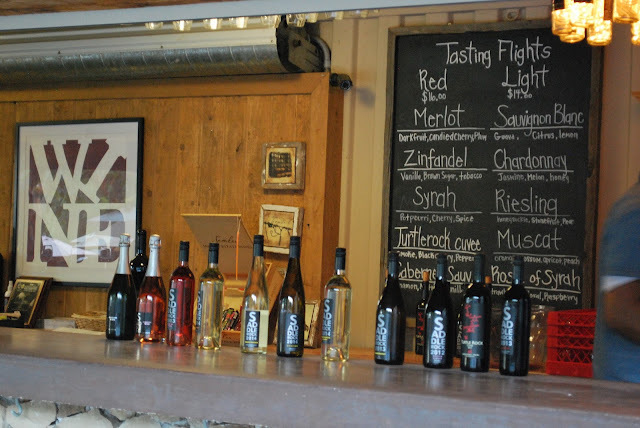 Instead of a Malibu wine tour, why not try wine-tasting closer to home at Wades Wines? Malibu Sundowner Brewery on Agoura Road combines some of the areas best wine varietals and some of the region’s best craft beer selections. We often get groups of friends reserving Los Angeles party bus services to come here on their party bus beer crawl. Their beer selection is remarkable with over a hundred different beers, while they offer over 40 types of wine. Another destination that might rival a Malibu wine tour would be the famous Stonehaus. Come enjoy wine-tasting outdoors by their fireplace! For beer-tastings, try a tour to Figueroa Mountain Brewery, which offers live entertainment on Saturday nights. Brent’s Deli has been rated one of the best delis in the Los Angeles area, while dining at the Lure Fish House is another favorite for our limo clientele. A recent trend throughout Southern California is book cinematic tours by limos or party bus vehicles. On these tours people book Los Angeles party bus services or limousines for a tour of their favorite movie-filming locations. Westlake is home to French Ranch, where a variety of movies were filmed. Just a few of the many movies filmed in Westlake include The Karate Kid, American Pie, Tarzan, and many more. We’ve even taken tourists on tours of movie sets in an LAX sedan right from their arrival at LAX. Click on the link underneath for more information on scenes and locations. The 1984 film The Karate Kid features the Hyatt Westlake Plaza hotel! See also our full list of Best Movies Filmed in Westlake Village! For more information about our the services we provide, either it being for a night out with Los Angeles party bus services, Temecula- or Malibu wine tour, wedding or LAX sedan services, feel free to also visit our websites. You may also request a free quote online for your Westlake Village limo service. For your limo in Westlake Village or anywhere else in Southern California, call us today for an instant quote! We are available 24/7, seven days per week!